Learning Analytics for 21st Century Competencies? Scaffolding deep reflection with automated feedback? All of my work has been around harnessing the digital world to get us to go beyond the surface and think more deeply. Up till now this has been largely focused on rational modes of thinking, inquiry and sensemaking — hence all the stuff on argumentation, dialogue/debate mapping and hypermedia. Finally, while we are certainly interested in improving information management, sharpening critical thinking and promoting sound argumentation, at the same time, these are only part of the story if knowledge mapping tools are to go beyond fostering critical analysis (albeit a worthy end in its own right), and provide support for shaping, not just analysing, the hardest kinds of policy deliberations. Those who are engaged in conflict resolution in the most strife-ridden communities and countries (not to mention the less extreme dynamics within our organisations), remind us that the key to making true progress is to establish the context for open dialogue in which stakeholders learn to listen to each other properly, and co- construct new realities (Isaacs, 1999; Kahane, 2004). However, this was still focused on dialogue, albeit the deeper listening aspects so important in reconciliation, rather than the critical thinking/rational discourse I had focused on. But 2008 was clearly something of a watershed for me, since I also began to think about bringing in research on completely different modes of being and engagement — namely the contemplative and the spiritual — and wrote a series of posts on the intersection of learning, creativity, computing — and critically — the contemplative mind. A lot has happened in the intervening years, and sparked by some recent tweets and ensuing links around sensemaking and complexity, I’ve been drawn back to this work, and can sense a new matrix of connections beckoning. Meanwhile, since the 2008 blog posts, as both a researcher and chair of school governors, I have been engaging firstly with the work of Guy Claxton [see my blog posts], and then increasingly with this network’s co-founder, Ruth Deakin Crick [blog posts], both of whom developed tools based on the original Learning Power project they ran. This has been hugely productive, enabling me to see how the capacities which are so clearly needed for the 21st century can, through good teacher development, be fostered in young people (including my own children), and in adults. In a second strand, I’ve gained much from the work of Dave Snowden, who has been on a fascinating journey from “knowledge management” in IBM, to making progress with the Cynefin framework and Cognitive Edge services in turning the emerging science of complexity into practical tools to help our institutions address these new challenges. Complexity science, organisational learning, learning-to-learn, and ecological resilience thinking, has started to come together in talks such as this, and this. A third strand of work has been the doctoral research by Al Selvin, who has been developing an empirically grounded framework which gives voice to the experience of expert practitioners using participatory, visual media (especially hypermedia) to scaffold real-time team sensemaking. Al’s work brings together many of conceptual strands that have long intruiged me – and some new ones outside my experience – in a powerful new configuration: sensemaking, narrative, aesthetics, ethics, and improvisation. David M. Levy, “To Grow in Wisdom: Vannevar Bush, Information Overload, and the Life of Leisure” Proceedings of the 5th ACM/IEEE-CS joint conference on Digital Libraries, (New York: ACM, 2005), 281-286. David M. Levy, “Information, silence, and sanctuary“, Ethics and Information Technology, 9 (2007), 233–236. David M. Levy, “No time to think: Reflections on information technology and contemplative scholarship“, Ethics and Information Technology, 9 (2007), 237–249. But it wasn’t until last week that I came across Alex Pang, who’s published a draft paper on the topic following a sabbatical at Microsoft Research Cambridge. I spent the weekend building wardrobes and listening to it read to me from my laptop by a speech-to-text tool, which (apart from reminding me of what machines don’t do well…) gave me an initial feel for what he’s doing, and some time to contemplate it while doing something manual (!). Contemplation is an ancient word describing a vast set of practices for deepening one’s spiritual awareness, connecting with the divine, or reaching enlightenment, that have been refined over thousands of years. While I believe we can draw on that tradition, it’s also necessary to abstract and simplify it. Here, I define contemplation to be a form of detached, calm engagement. Each of these terms has layers worth exploring. By detached I mean an effort to see without preconditions. Detachment allows one to avoid being surprised by novelty, to be blindsided, or to miss unexpected events because of limits caused by over-reliance on familiar routines and perspective. [Langer and Moldoveau, 2000] Detachment also allows a person to observe themselves, to evaluate their reactions to a situation in real time, and to more quickly and purposefully alter those reactions: to ignore hunger or pain or suspend judgment, for example. By calm I mean the ability of users to mobilize their skill and self-control, to avoid excitement, and thus maintain detachment and engagement. Engagement is the ability to focus attention on a subject, to keep the mind from wandering off on its own. It also requires paying attention to yourself. If the external world or your task is the center of your attention, your own senses and reactions are at the periphery: you monitor and observe them in order to be aware of their influence, not because there are worth your attention on their own. Pang goes on to make the case that far from being a solo phenomenon locked in the mind, “contemplation” is skillful, embodied, solitary and social, and spatial. He then proposes a number of design principles (see below), which I’m still processing. Given my 2008 brush with these ideas, it’s exciting to see this line of work unfolding, and it sparks the following set of questions, to which I currently have fragmented possible responses. We know that contemplation, or the contemplative mind/stance, can help us think and learn more deeply. How do we design technology to augment this? I don’t yet have any generic design principles to suggest, but am drawn — doubtless shaped by my previous work — to the importance of connection, and sparking associations that might not otherwise have been made. Work with Clara Mancini on Cognitive Coherence Relations theory and hypermedia may be a source to return to here, since it deals with fundamental, almost primitive associative building blocks that we seem to use as humans, such as co-occurrence and causality [1,2]. Complex systems defy our rational capacities to grasp in their entirety, but could it be that our unconscious minds, nurtured through the disciplines of contemplation, and augmented through technology (e.g. visualization and network science) holds a key? Can contemplative computing serve as a way of expanding one’s sense of the bigger picture, seeing new connections and patterns? 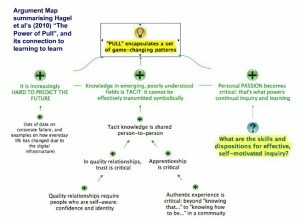 Much of my work inspired by the challenges of Rittel’s wicked problems has explored computer-supported discourse and visualization as one approach, but requiring users to make their thinking explicit and visible as these approaches do, this does not seem in the same vein as contemplation. How does narrative relate to contemplation? Are they cousins? Snowden, Weick, Gabriel, Orr and many others place significant emphasis on narrative as a distinctive and important way of knowing, particularly in complex, turbulent times. Browning & Boudès provide an interesting synthesis of Karl Weick’s and Dave Snowden’s work on managing complexity, with respect to narrative. My student Joanna Kwiat reviewed the literature on narratological models, and why story is a powerful mode of professional knowledge-sharing. Pang points to the narratives that digital media lead us to construct about ourselves. What is the relationship between Learning Power, the unconscious, and the contemplative mind? Two of the Learning Power dimensions in Ruth Deakin Crick’s ELLI tool highlight creativity and strategic awareness. I’ve already discussed how the dimension of resilience connects to the dynamics of creativity and inhabiting the discomfort of liminal space. How can contemplative computing promote mindful presence and selfless attention to the task in hand? This was the focus of Al Selvin’s research (see above) who reviews the extensive research into the professional practices of those for whom this is crucial, such as facilitators/conflict resolution, and other forms of professional practice. Pang reviews some literature on professions bring contemplation into their practices, but I don’t know whether anyone else has answered this question with respect to contemplative computing. 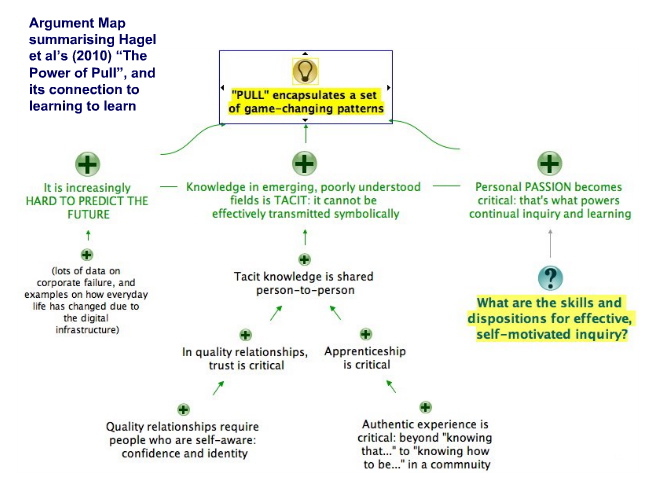 Is there an important relationship between contemplation, computing, and the new kinds of pedagogies and curricula needed for today? Again, I have poorly developed thoughts on this. I found Helen Jelfs‘ doctoral research with Ruth one stimulating source, which reviews the shift in worldviews we have witnessed though classical, modern, postmodern and now relational — shifts which may come to be reflected our educational paradigms. Another line of inquiry is to go back to one of the distinctive features of contemplative practices from all of the major traditions: that one comes to a truer sense of oneself, and one’s relationship with “the bigger picture” — however you choose to name this. So, this is pointing to the construction of narrative about one’s identity, which Ruth Deakin Crick has argued sits at the heart of authentic, deep learning which connects with our life stories. Contemplative Computing in action should, arguably, foster such qualities. 10 years to wrestle with complexity + learning? Oops sorry Alex — I fixed the typos! You raise some very interesting questions in the latter section of your post, which I’m not able to take up; maybe it’s something you’ll be able to take on (though I’ve written a bit about mindfulness and futures, following on the work of Rafael Ramirez and Jerry Ravetz). But who the heck is this Yang guy, and why is he stealing my work?